Last week’s party trick was so much fun, that I think I’ll offer another! I wish I could take full credit for this idea but truthfully, this picture appeared in Donna Hay magazine originally. 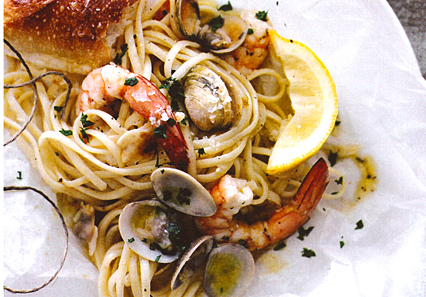 When it was featured in her magazine, Donna’s team recommended popping cooked, lightly sauced pasta in a parchment pouch with raw seafood and then heating it gently to cook the shellfish and reheat the pasta. I love this idea for entertaining since serving pasta to a crowd can be a rather steamy, messy affair that leaves the hostess’s hair either limp or frizzy. So, if you’re a pasta lover but don’t have perfectly bouncing and behaving locks but like to look good form company, this idea is for you! Do you often serve pasta for company? If so, do you go for baked dishes like lasagna or brave the humidity and cook noodles in a vat of salted water? What would you eat for a month straight? What food could I eat three meals a day for a month? This article about Matt McClellan, a Florida pizza restaurant owner, encouraged me to ponder this question. You see, McClellan is pulling a publicity stunt where he will eat nothing but pizza for a month. His intention is to bring not only attention to his own pizzeria but to prove that he can improve his health by switching to pizza and cutting out his other menu staples: Taco Bell and Burger King. Criticizing McClellan’s plan would be so easy, but that’s not what this post is about. No, it’s about what food do you like that is flexible enough in its execution to actually be palatable for a month? While pasta, soup, stir-fry and risotto seem to offer as much flexibility as a pizza, I think I’d opt for sandwiches since they really do have limitless variations. What about you? Is there a food category that you could enjoy for 90 meals in a row? I was tempted to tell her my history with this gadget but I really didn’t want to underline that I’m pretty much a dinosaur who has been in this business far longer than most people can remember. Besides, I love a plate of fresh saffron and lime noodles dressed lightly with olive oil (or butter) and garnished with a halo of whisper-thin curls of shaved pecorino cheese, so I got over myself and headed to the kitchen instead. Here’s the recipe so you can enjoy a bowl of these noodles, too. Place flour in the mixing bowl of a stand mixer. Using a fork, beat eggs with lime, saffron and salt. Add the eggs to the bowl and mix using a dough hook until a soft dough forms. Knead dough using the dough hook for 5 minutes until dough is smooth and elastic. Knead into a ball and cover with plastic wrap; let rest for 20 minutes. Divide dough into 3 pieces to make handling easier; cover. Flatten each piece of dough with your hand or a rolling pin; dust with flour. Feed through the widest setting of the pasta attachment rollers 3 times, lightly flouring after each pass through the machine. Set machine to next narrowest setting; run dough through once. Repeat, running dough through rollers until next-to-finest setting is reached. Cut the dough in half if it becomes too long to handle easily. Lightly flour dough; run through finest setting. Repeat with remaining portions of dough. Hang the rolled dough over a pasta rack (you can make one by balancing a clean broomstick between two chairs) until leathery but not dry about 20 minutes. Change setting from rolling to cutting position. 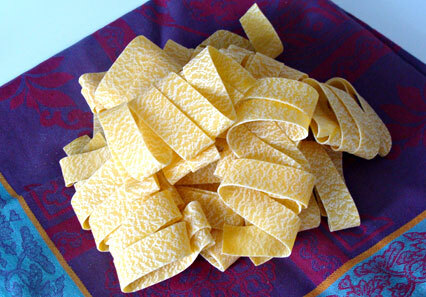 Cut pasta into 10 – to 12-in (25 to 30 cm) lengths. Feed each length through the cutter. To cook: add noodles in lots of salted, boiling water and boil for 2 minutes or until al dente. Drain in a colander and toss with extra virgin olive oil or butter to coat. Season to taste. Okay, so I cheated when I made dinner using this prepared Italian sausage meat as the base for meatballs, but you know what? These meatballs were pretty great tasting, held together beautifully, and gave my son a new version of his favourite pasta meal without causing me, his chief cook and bottle washer, any muss or fuss. After the meat was browned, I added pasta sauce and sliced green olives to the pan and simmered the mixture for 20 minutes. I served the completed sauce over papparadelle noodles and it was a very good meal. I’ll definitely buy this sausage meat product again to use to make pizza toppings or for making a meat sauce to spread between sheets of lasagna. 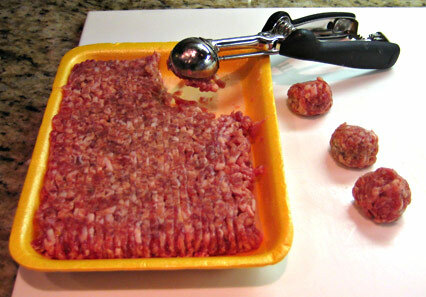 I may use it for making meatballs again, too. What grocery store short-cut products do you use to make dinnertime preparation easier? Do jars of minced ginger make you cringe or yell ‘ha-zaa!’? Will bought salad dressing cut it on a weeknight or do you start from scratch every time? I know it seems a bit odd to be featuring a pantry item as part of my worth replacing series but you know, I do replace these wonderful egg-y noodles as soon as I place an empty package into the recycle box. Although I only feast on them occasionally myself, my son Oliver eats this pasta as often as I’ll cook it. He loves papparadelle simply prepared with butter, salt and lots of cracked pepper; in homemade chicken broth studded with carrot coins and bits of celery; or – and this is when I always join him – under a cloak of my homemade Bolognese sauce. Pasta was one of the 10 chapters in my last book Dana’s Top Ten Table, because it is, year-after-year, one of the 10 favourite things that research shows people choose to make for dinner. In fact, if I were to look back over the last 10 years, pasta would likely be in the top 5 (maybe even the top 3) every time. This popularity wasn’t always the case for pasta. In fact, until the 1960’s, pasta was lucky to play second fiddle to the long established Canadian concertmaster of meal time, the potato. What changed? We did. Immigration brought people from all over to Canada and many of our newcomers were Italian born. In fact, until 1981, Italy was the #2 birthplace for new Canadians. Even now that immigration patterns have shifted, Italian remains the second most often spoken unofficial language in this country (Chinese is first). This influx brought with it many good cooks and offered all of us an opportunity to meet and fall in love with Italian foods including pasta, pizza and risotto: the holy trinity of Italian starch. Now that I’ve turned your thoughts to Italian food, I hope you’ll jot over to Charmian Christie’s blog where she’ll be celebrating this much loved cuisine with recipes and words all week long. Today I believe she may even be posting my very popular Stromboli recipe; but, if you prefer to have papparadelle tonight, I offer here my Bolognese recipe as well. Authentic Bolognese sauce is a zesty, full-bodied meat and tomato concoction that is the backbone of Northern Italian home cooking. The secret ingredient to a true and satisfying Bolognese sauce is milk. Added in such a small amount that it is not perceptible as a flavouring ingredient, the milk mellows and helps to blend the stronger flavours such as white wine, garlic and tomatoes. Another of the key ingredients in a successful Bolognese sauce is bacon. Added in a small amount, the bacon helps to deepen and extend the flavour of the veal (or beef) and adds richness that helps to emulsify the sauce. Once you try this authentic Bolognese sauce recipe, tossing spaghetti with jarred pasta sauce will definitely feel like settling for a half measure. So, since you’ll want to use this sauce often, I’ve written it as a big batch and recommend that you freeze family meal size portions. Having this frozen asset on hand will make many weeknight crunches easier to endure and more delicious, too! Place onions, carrots, celery and garlic in a food processor. Pulse until finely chopped. Place vegetables and oil in a large, heavy pot over medium heat. Stir in salt, pepper, basil, oregano and thyme leaves. Cook, stirring occasionally, until softened, about 5 minutes. Add bacon and veal. Cook over medium-high heat, stirring and breaking up lumps until no longer pink, about 6 minutes. Stir in wine, tomato paste, tomato puree and milk. Reduce heat to low and simmer, gently for 1 to 1 1/2 hours. Makes about 8 cups. Tip: Sauce may be made ahead. Cool, uncovered, before chilling, covered. Freeze sauce in batches of 2 cups (500 mL) each, enough to cover 8 cups of pasta. *Recipe from Dana’s Top Ten Table: 200 Fresh Takes on Family-Favourite Meals. Published by HarperCollins Publishers Ltd. Copyright (c) 2007 by Dana McCauley. All rights reserved. Reprinted by permission of HarperCollins Publishers Ltd.